Trailing arbutus (Epigaea repens) bloom with inset of a specimen sheet with trailing arbutus collected by notable botanist Charles Deam in 1921. Photo of trailing arbutus bloom by Michael Chitwood. The specimen label information has been transcribed for all 128 lichen, 1,575 bryophyte, 3,813 fungus, and 152,433 vascular plant specimens—totaling nearly 158,000 specimens! The second milestone was achieved with completion of the compilation of the geographic coordinates of the collecting sites for all of the IU Herbarium's Indiana specimens. In 2013 a workplan was approved for digitizing the entire IU Herbarium. The IU Herbarium was established in 1885 as a research facility and specimen repository that documents our knowledge of Indiana’s flora and the research conducted by IU’s botanical faculty and students. The digitization project started in fall 2014 with the goal of completing the project by June 2019—in time for IU’s bicentennial celebration. The initial phases of inventorying (June 2015), curating (June 2017), and photographing the accessioned specimens (January 2018) were completed on time. The race was on to complete the final two phases: (1) transcribing the specimen label information into the online databases and (2) determining the latitude/longitude of the collecting sites so that the information can be displayed and accessed in map-based information systems. The primary label transcription for all specimens and georeferencing the 79,604 Indiana specimens were both completed in November 2018. Most phases of the workplan had overlapping organization so that each new phase started as soon as the previous phase made sufficient initial progress. Georeferencing, however, is most efficiently completed after the primary label transcription and subsequent quality control work are done. The a priori workplan captured this efficiency by creating a skeletal database record (with species name and locality to the state and county level) at the time of specimen imaging. This information then was used to prioritize label transcription for specimens from Indiana ahead of the other states and from elsewhere in the world. The large number of specimens from Indiana is due to the fact that the IU Herbarium now holds the collection of Charles C. Deam. Charlie and his wife Stella decided in 1905 to document the county-by-county distribution of the Indiana vascular plant flora. The results were published in Deam’s Flora of Indiana (1940). Each species entry included a county outline map for Indiana that indicated where the species was found and when it flowered. Deam's attention to detail spawned a statewide effort to update county distribution records published annually in the Proceedings of the Indiana Academy of Science. 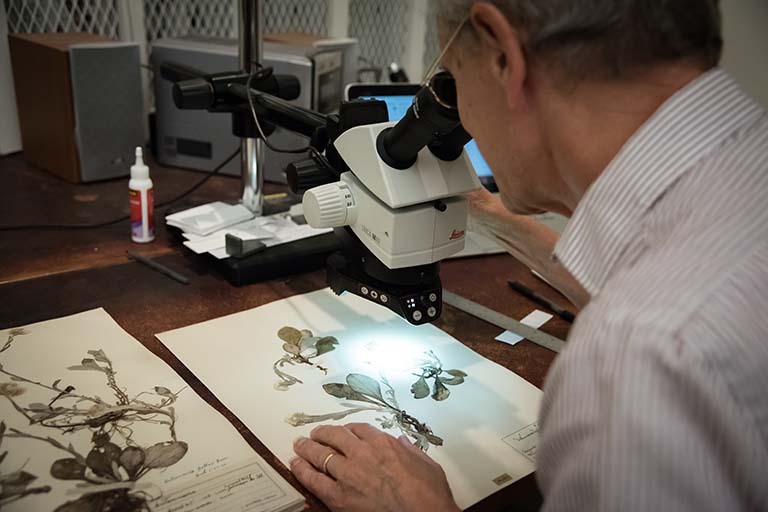 Although the IU Herbarium holds the oldest and historically most important collection of Indiana plant specimens, complete documentation of our knowledge of the Indiana flora must await digitization of the remaining Indiana specimens held in other herbaria. In the interim, the IU Herbarium has developed several features of the Consortium of Midwest Herbaria data portal. The portal provides public access to IU’s vascular plant information. 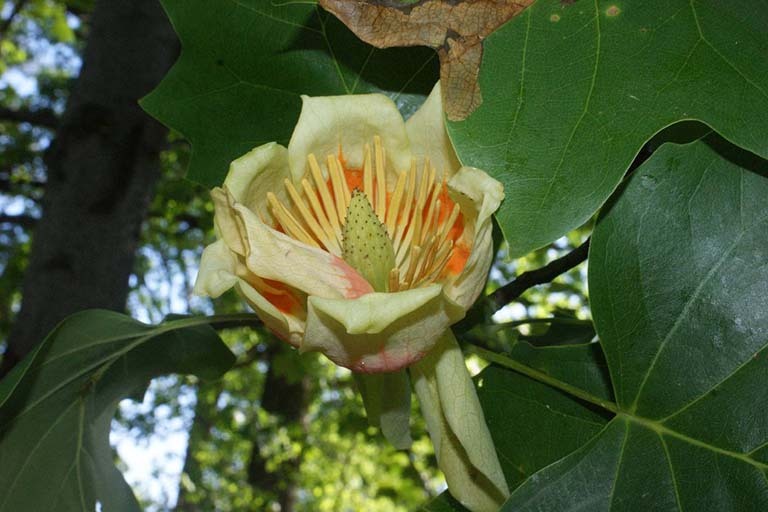 A search for Liriodendron tulipifera (tulip tree, tulip poplar, yellow poplar) takes users to the corresponding species page. This page contains photographs of living plants, information about the species, a map of the digitized specimens, and over 4,000 photographed herbarium specimens. 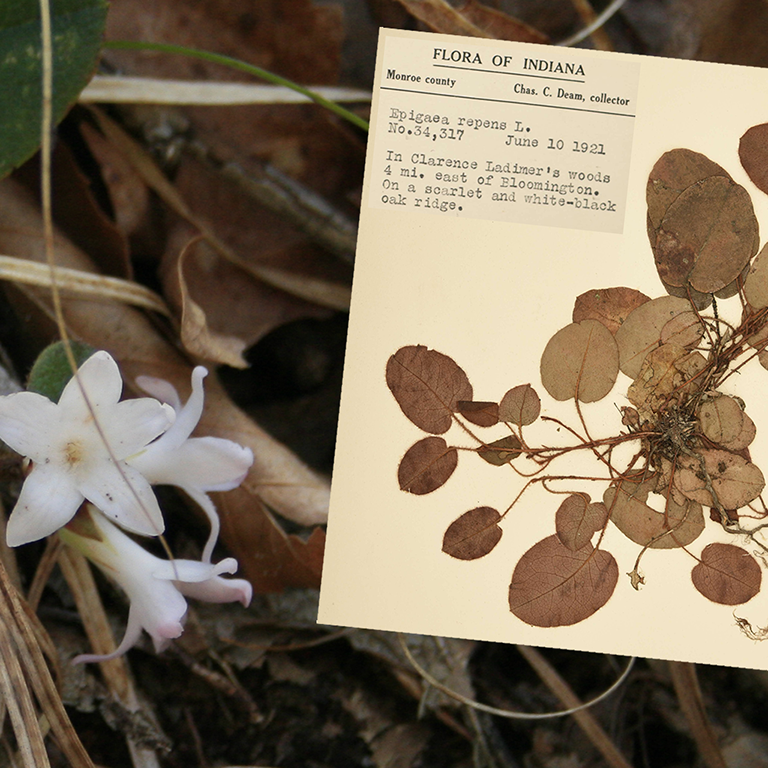 The tab labeled ‘Gleason & Cronquist’ provides a technical description from the authoritative regional manual, whereas the tab labeled ‘Indiana Flora’ presents Deam’s observations about the species based on 35 years of fieldwork. The menu bar at the top of the page includes ‘Flora Projects,’ and there is a section for Indiana. Selecting the ‘County Checklists: Monroe’ takes the user to checklist explorer function, with the common names already added to the scientific names. Checking the box for ‘Display as Images’ and then clicking on the button ‘Rebuild List’ presents a photo gallery of species. Finally, the golden key symbol takes users to an online identification tool with easily observable characters that helps people learn about the Indiana flora. The IU Herbarium staff must yet finish an ambitious workload in order to meet the goal of complete herbarium digitization six months from now. Eric Knox, director of the IU Herbarium, is confident that the quality control work and georeferencing—which is now focused on the states outside Indiana—will be done on time. Georeferencing the IU Herbarium's specimens from elsewhere in the world will then complete the digitization project. 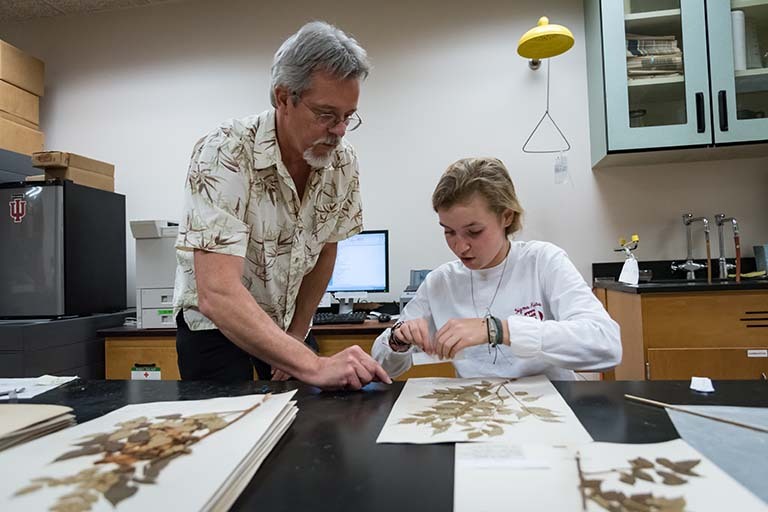 The IU Herbarium Digitization Project has been funded by the Indiana University's Department of Biology, College of Arts and Sciences, Vice Provost for Research, Vice President for Research, IU Libraries, and University Information Technology Services. The work has been accomplished by more than 75 undergraduate curatorial assistants—with special thanks to Associate Curator Paul Rockrock, and Senior Curatorial Assistants Tanner Mayfield, Daniel Layton, Maggie Vincent, and Laura White. The Consortium of Midwest Herbaria data portal does not yet have high-quality photos that show the diagnostic features of all the Indiana species. Citizen scientists from throughout Indiana are encouraged to contribute photographs needed to complete this feature. To learn more about what is needed and how to contribute your photographs, contact Paul Rothrock at perothro@indiana.edu or (812) 855-5007.